…this on the cover of their latest issue! Isn’t this simply gorgeous? I love the way the pumpkins look as though they have been covered with fabric even though it is actually paper! Sooo...the magazine hopped in my cart and went straight home with me! Next, I went right to work assembling what I needed. And, as luck would have it, just about everything was half price at Michael’s…including the cream faux pumpkins! I decided that a few things about my pumpkins would be different from those in Country Living. First, I chose a damask pattern rather than toile for one of them. There’s already so much toile in my house and I wanted these pumpkins to stand out. And then, I also decided that I would use the cream pumpkins just as they are rather than paint them white. That just fits better with my decor. Other than that, for the most part, I followed their instructions, found online here. 1. I chose a fabric with a simple damask pattern that would be easy to work with…Premier Prints Avery in Greenage…and bought just enough to have one repeat of the design. I scanned and printed it, making several copies. I used Walmart's cheapest copy paper so that it would be as thin as possible. Remember…you are working with paper copies of fabric…not fabric! 2. Next, I cut them out and spaced them according to the design, taping them to the pumpkin. 3. I removed the tape and attached each piece of the design to the pumpkin one by one, using matte finish Mod Podge…my new BFF. (Mine was a 25 cent yard sale find.) The process requires some finesse and patience and, quite honestly, it helps if you have some experience with découpaging spheres. 4. Give the pumpkin a thin all-over coat, let dry and you are done! This was the easiest one, so if you only want one, I suggest this one! 1. I couldn’t find any fabric that would do, so I bought scrap booking paper and scanned and printed it. The scrap booking paper would be too thick as is. Plus, I needed about 3 pages to cover the pumpkin. 2. I cut lengthwise pieces about 1 1/2 inches wide, working within the pattern. I attached them with Mod Podge as before. It helps to cut alternating notches about 1/3 of the way in to allow for the curves of the pumpkin. 3. Eventually, the strips got off a little and I had to straighten them back up by piecing in a few odd shapes. Here, you can see an empty spot I am about to cover. 4. Once again, I finished with another final all-over coat of Mod Podge and…taa daa! The pumpkin quilt design was downloaded from Country Living’s web site. I followed their instructions and measured and calculated the size and number of designs I would need and adjusted. A program such as Photoscape…free to download…was really helpful here, since I had to adjust the color a little also. I found it helpful to make small pencil marks on the pumpkin for the top and bottom of the design. The little yellow lines are perfect places to cut in some notches to allow for the curve of the pumpkin. If it’s not perfect, it’s OK since you can’t see all sides of the pumpkin at once! A final coat of Mod Podge to the whole pumpkin and you are through! I didn't have a suitable stand for the pumpkins, so I made my own by painting a small flower pot and a larger saucer and hot-gluing them together. They were also half-price at Michael’s! I used an ivory spray paint since my pumpkins are cream. Baby Kitty says his favorite pumpkin is the one with orange patches…I wonder why! Here are my pumpkins in their copy-cat magazine pose…work it, girls! And here they are with my inspiration…not exactly alike, but just what I wanted for my house! Total spent on the project...about $25. Not bad, huh? And I'll have them forever! What do you think? And...a little added note...I am excited to say that my pumpkins were featured in their magazine! Thanks, Country Living! I think they look absolutely awesome! Your grouping is my favorite of the two...it's more vibrant and fun!! Love the patterns you choose for the pumpkins! Makes me want to run out and buy some faux pumpkins before they're all gone. And after seeing your post, I'm sure they will be! I especially like the picture with kitty. Debbie!! These are fabulous. When I got my copy of CL the other day, I thought Wow! You did a wonderful job and I love how you photographed your pumpkins! OMG Debbie....you are so very talented! I can tell you were a teacher because you are so very good at following instructions! I am wondering can you just use scrapbook paper that you already have instead of scanning it in? These are fabulous....better than the mag.! REally pretty -- I especially like your damask version. I have used pretty paper napkins, separated, to decoupage on various things, and because the paper is so thin, it also works well on curved objects. I immediately thought of that when I saw that CL cover shot. Did you use regular printer paper, or something thinner? Thanks, Cindy and Ellen! I'm glad you like them. To answer your questions, I think the scrap booking paper would be too thick for découpage...or at least, this paper was. I printed everything on the cheapest paper that Walmart sells so that it would be thin and easy to work with! Paper napkins are a great idea, Ellen! They look fabulous and of course you make it look so easy. Love 'em! You've done a fantastic job! My Country Living magazine was waiting for me when I returned from visiting my sister and painting pumpkins - I just loved the looks created! Great step by step tutorial! What a great job -- I LOVE it! Debbie, they are fantastic and every bit as good as the CL ones. In fact I like how your colors are a little more vivid than those in CL. Thanks for sharing, these look like a great project to share at church. Thank you SO MUCH for sharing with us how you made those FABULOUS pumpkins! Including all the tips and tricks that you used will help us when we want to copy your copy of the pumpkins. Absolutely wonderful, Debbie! Love them, and thank you for sharing them with us. Your pumpkins are as good as the magazine, in fact I am liking your patterns maybe even more than the magazine pumpkins. Well done. Those have to be the prettiest pumpkins I have seen...♥♥♥ the one in the pedestal. Thanks, Debbie...I may just have to give this a try. Debbie, you did a marvelous job. I have that mag, too. I love the patterns you used. They're beautiful, Debbie! Thank you for sharing and inspiring me to do this project! they turned out GORGEOUS!!!!!! love them! Fabulous! I just received the CL issue and have been dying to try this. Thanks for the great tutorial! amazing job Debbie! And yours have something that CLs doesn't...Baby Kitty in the photo! That is a precious picture! Fantastic! I loved these when I saw them on the cover. Yours are wonderful! Great job! I blogged on them from the issue and so glad you actually did them and posted! I'm not that crafty. They turned out brilliantly...just as good as the magazine examples. Congratulations! I agree with Baby Kitty. That is my favorite, too. Hugs, Deb=^..^=x4 + a few more. Just about as cute as a June bug on a magnolia blossom in springtime. I love these, they are so clever and look so professional. I think you did a great job and they are faux so they will last forever. I am impressed. Richard from My Old Historic house. I loved you stand too! They're beautiful, you did a fantastic job! I found your link at WUW and I gotta say, your pumpkins turned out fabulous! Love the colors and designs you chose! I made a pumpkin stand just like yours, but I painted mine green! I painted polka-dots on my pumpkin! I want to try some of the Country Living pumpkins, too. Yours turned out great! Oh -- this is absolutely FABULOUS!!! What a great idea to scan the fabric and print it -- never ever thought of that!! You are brilliant! Thanks for sharing these with us! I bought that magazine just for the decorating items. But I like YOUR pumkins better! Good job! I saw these in their magazine and wished that I could do this. Yours are really wonderful looking, actually prettier than the ones in the mag. Love, Love, Love your copycat pumpkins!!! I saw those, too, & want to try them. Yours look gorgeous...prettier than Country Living!!! Oh my goodness, these are amazing! I love them all, especially the damask. Good job! I'm nuts about it! Honestly, this might just be my favorite fall project that I've seen this year. I think these are fabulous and you did a superior job! Baby kitty looks so cute with the pumpkins! You did a fabulous job, darling!!! Seriously...I thought these were photos from the magazine! Excellent!! !OH~h~h, and yes, thanks to your handsome assistant! Thank you so much for posting! This is why I love blogging so much. You saved me a lot of work by showing the best way to do it. I like yours better than the Country living ones! Thank you for showing us your version and that you can make changes and still come out with a pumpkin display. Gorgeous choices! I hadn't seen the magazine yet so thanks for brining it our attention. Your pumpkins look incredible and the vignette you created to display them looks beautiful! Debbie -- these are fabulous! I thought they were pretty on the magazine cover -- your's are just as pretty, if not prettier! I think my first comment was lost. If not, please delete this one. I never finished reading my CL yet to see how they made those, but just by looking at the photos here, I couldn't tell yours from CL's. I like your's better b/c the colors are more vivid, and I really like the damask. You did another great 'knock-off' project. Have a great weekend! That cover really caught the eyes of a lot of readers, including mine. Your verisons in both of the prints are so much cuter than Country Living! Isn't it amazing that blogger are always knocking off something, only to make it better! I love it! I think you have more than your fair share of patience! I'd be covered in glue and end up decoupaging the cats. And who would have thought to use a planter dish and pot to make a stand? Great work/play! Beautiful and such a good idea. They really stand out. I love them! They turned out beautiful. I've pinned this - can't wait to make them. 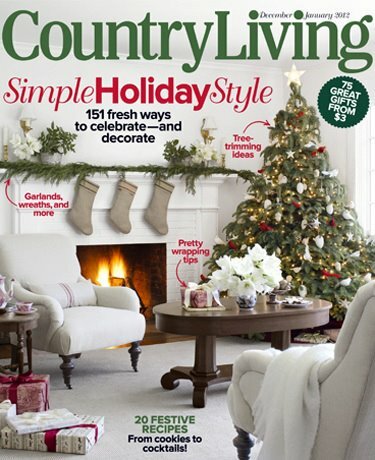 I loved the pumpkins on the cover of Country Living. Yours look gorgeous! I also think your stand is genius. What a super idea! Thanks for sharing your project with us. I will be trying this, too! When my copy of Country Living arrived and I saw the cover, I think I actualy swooned! I can't wait to make some. the ones you created are GORGEOUS! thanks for more inspiration and for sharing at TTF. Have a fantastic weekend! I was so excited when I saw your post because I just started working on my modge podge pumpkins today! I got the Country Living magazine the other day and just LOVED the cover and knew I would have to do it. I am trying a houndstooth pattern - we'll see how it turns out! Yours look beautiful! I think they're beautiful and you've inspired me to do something with my cream colored pumpkins from last year... or was it the year before! Excellent tutorial as always! Thanks so much! now... I'm off to Round Top with Candy to shop till we drop! 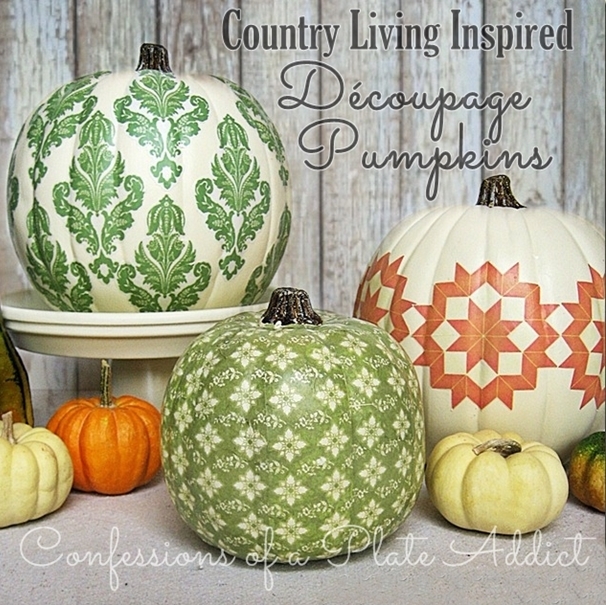 Your pumpkins are gorgeous - I especially love the damask one...even more so than the toile. I've never tried Modge Podge, but it seems to have a multitude of uses, so I'll have to give it a go! Great, easy to follow tutorial - thanks for sharing! I'm your newest follower and can't wait to come back. They look great! I just read my issue and was looking at these! I got their copy of the Mag too but I wasn't quite inspired to try my hand at this until I saw your results and tutorial! Fabulous! I ADORE it! I like the ones in Country Living, but I think yours are much prettier. I've really been struggling with my mantle, but I think you can me an idea for just what I need to do. I'm your newest email subscriber! So cute! And easy enough to have kids help! Sorry for a double post, Debbie! I goofed with the one above and erased it. LOL! I am so excited over these. They are PRECIOUS. Just love them to bits. Thanks for sharing the how-to with us. These are gorgeous, I made 3, but they are not nearly as perfected as yours but still very nice. One I did with pictures of my daughter taken in fall/halloween and when she cme for dinner last night I gave it to her. She has just bought her first home. The other two were smaller and I used napkins. One had birds on it and I love it. Thank you for the tips, and its too bad these pumpkins won't last a lifetime. You did such a fab job on yours. Good for you! I love those pumpkins! Can't believe how easy you made it look. Thanks for the tutorial! I think your pumpkins look better than the magazine! I especially love the damask pumpkin. I'm headed to Michaels! I am so in love with your pumpkins. I've seen tons this year - online, in magazines, PINTEREST!!! But yours take top honors. There is just something about that green damask that spoke to me. Love it! Wow, they are strikingly beautiful. They have the exact look and feel of the ones in the inspiration photo. Well done. FABULOUS Job, Debbie! Yours look waaaay better than the magazines & that shot of Babby Kitty cracked me up! I love how your mind works, Lady! Thank you SO much for sharing these. I'm going to try black damask on some. Good gosh - your punkins are gorgeous! Nice job!!! Great job! I was over the moon once I saw the cover myself. You did a great job and show that it really is easy. So happy you brought this to Seasonal Sundays. Gorgeous job! I love seasonal decorations that don't 'overtake' the home but compliment it...which I think these would do beautifully! The pumpkins are FABULOUS! You've done a fantastic job. I feel inspired! What a wonderful idea! Thank you for sharing your project with us. Your pumpkins turned out beautifully! Great job! Hi, I'm visiting from next door at Met. Monday! I just picked up that magazine last night and wanted to try the pumpkins. Thanks for paving the way and letting me know all the details. Looks like a fun project and I love the way yours turned out. These are beautiful!! You did a wonderful job and they look so much like your inspiration. Love them! Can't wait to give this a try with my mom - we HEART Halloween! Tanks for sharing and in advance for answering! No, they are "faux" pumpkins from Michael's, so they will keep forever! Oh I just love your darling pumpkins! I hope you will add your lovely metamorphosis to my Fall in Love linky party on Wednesday. I loved them in the magazine and love yours too! Great job! And thanks for the tutorial. I've been dying to try these - yours are marvy and I love the picture with Baby Kitty! Love them! I have been wanting to try them the minute I saw the magazine cover. I see you were a french teacher. My daughter loves taking french - she is a bit obsessed and wants to go to France for her 16th bday. Any tips for a family of 6 traveling to France? I would love to hear them! Isn't Modge Podge awesome stuff. My favorite is the green toile pumpkin. I've seen a lot of pumpkins on link parties, but these are by far my favorite! They are so pretty! WOW they are absolutely the cutest pumpkins ever! Thanks for the inspiration, now I need to get busy and mod podge me some pumpkins. Girl you have done another awesome job on this project!!! They look GREAT...thanks so much for sharing them at NIFTY THRIFTY TUESDAY!!! Saw your inspiration in Country Living, but I wasn't ambitious enough to go for it. Yours are stunning--better than CL's. I love, love, love the toile pumpkin. I saw the pumpkins in Country Living and thought "how cute". Yours are even better! Shoot, I paid full price for mine at Michael's!!! I haven't done anything with them yet because I couldn't decide what to do, but now that I have read your fabulous tutorial, I think I need to get started. Love all the suggestions from what paper to use and to copy fabric. Thanks a ton. What a clever and beautiful idea! Thanks for sharing and I'm following you. These came out so sweet , It makes me want to run out and buy pumpkins! Love these so much---I totally want to try this! I am your 111th comment! wow!! Your pumpkins and tutorial are really neat. I am pretty sure you will get a few 'highlights' on the blogs you have post to!! Awesome stuff! This is a very cool idea. I think I'm off to Michaels to see if they have any more of those cream pumpkins left. I love your Idea for your Beautiful Pumpkins.. I also need to see if Michaels has some cream Pumpkins. Debbie- these are amazing!!!! I love this idea and so hope I have some time to make one or 2!! We got home from our camping trip and your wonderful book was waiting for me! Great projects and the pictures are just so beautiful! Getting ready for overnight guests to arrive any minute but I wanted to come over and say thank you again!! Love the little tag and key to- I have it on the little happy fall vignette I showed off in one of my last posts. Thank you for blessing me with this great book and your wonderful blog! These are beautiful. Mod Podge is truly amazing. Mixed with your talent! Oh my gosh look at all these comments! I can see why...these are stunning. Well done. Have a wonderful weekend! The pumpkins are fabulous and I admire you for tackling the job. I probably will not but am so grateful to know where I can find white pumpkins. We don't have a Michaels in my little town but I'm going through a town that does tomorrow. How fortunate that I read your blog tonight. I am a newbie to your pages. Debbie, I think you have the chic's pumpkins in blogland. They really did turn out perfect! What a professional looking job! I really like the patterns and colors you chose. Thanks for a great tutorial! These are fabulous, Debbie! They look so much better than the ones you copied..love the damask. Thanks again for linking to the Open House party. Amazingly gorgeous! I love them!! Thanks for sharing your Fall pretties with us at French Cupboard's Handmade Harvest. Awesome!!! I have to try one - thanks for sharing! Debbie, I know I'm repeating what everyone else has said but your pumpkins are just beyond beautiful! stunning! Thank you so much for sharing with us how you created them. Amazing! Really great job! I am impressed with your diligence and ingenuity! Great project! I found & purchased the same magazine! I used napkins for my project, but I must say my pumpkins didn't turn out as nice as yours. Great job! Those are beyond amazing!! I love them truely love them!! I was going to do these exact same pumpkins as I, too, fell in love with the CL cover! I just love these pumpkins. I will be featuring them tonight at my Fall into Fall party that opens at 8pm EST. Please stop by and pick up an I've Been Featured button. Thanks so much. LOVE it!! I actually like yours better. I have to do this before the season ends. Last year I tried Martha Stewart's glittered pumpkins. This year these. Woo-hoo!! Can't get enough pumpkins in autumn. Debbie, Kathysue just left a comment saying you had découpaged pumpkins, too. So I had to see them. I love yours! Love your idea of using a white pumpkin and just placing the individual patterns on top. It's looks great! Unfortunately, they only had really tall thin pumpkins when I visited the Michael's near my home. THESE are Spectacular Debbie! Also an inspiration that makes me wanna try it. I think you did a mighty fine job here, ma'am....they are really pretty. These are just great! Dare I say even better then the original? Great job! What a great dupe!! Yours look even better than the originals! What talent you have!! Thanks for sharing!! These are beautiful, you did a great job, more gorgeous than the inspiration. yours are so elegant and well done. Your make the magazines all look bad if you keep this up~! truly beautiful. Love your copy and your cat! Fantastic copy-cat idea. I would never have thought of photocopying them onto thinner, cheaper paper so that they decoupage more easily. Well done. These are BEAUTIFUL!! What a great idea...thanks for sharing. I found your blog from the Debbiedoos blogging Party. I'm your newest follower. I'd love you to stop by my blog & follow along! No wonder they featured your pumpkins... Your picture was far and away better than theirs! I am going to do puimpkins like this, this year. Decorating for fall is my FAVORITE.... because it means Christmas is close...which is also my favorite!!! What a great idea!! You did a fantastic job! Thanks for sharing!